We want to begin by saying thank you! Thank you to the many, many Rappahannock County Democrats who stepped up over the weeks and months to turn out support for Leslie Cockburn for Congress and Tim Kaine for Senate. Because of your determination, hard work, and boundless enthusiasm, our field operations and approach to outreach have forever been transformed, with radical improvements and growth in all aspects of organizing. A vast increase in our get-out-the-vote efforts. We started knocking on doors in July. More than 1,000 homes visited by canvassers, with many new canvassers joining the action. A robust social media effort. We added scores of new followers on Facebook over the past several months, built up our MailChimp list, and updated and improved our website, www.RappDems.org. Full-day staffing at all the six polling stations in Rappahannock County, with signs, sample ballots, and literature. Did we move the needle? Decidedly, yes. With 1,837 votes for Leslie Cockburn in Rappahannock County, we increased our voter turnout 20 percent from the 2014 mid-term election. The point spread between Leslie and her opponent was the smallest in decades. Leslie outperformed Democratic Senate incumbent Tim Kaine in Rappahannock and the 5th District over his Republican opponent, Corey Stewart, an outspoken Trump supporter and white nationalist. We solidified our Democratic hold in key areas: Flint Hill, Sperryville and the absentee votes. This is just the beginning. We’ve established a strong foundation for future Get Out the Vote efforts. 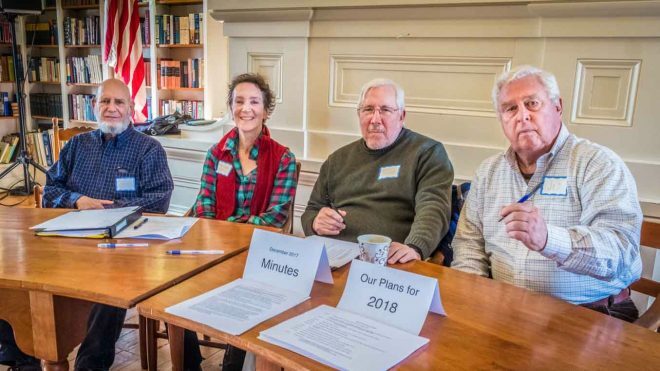 We’ve developed strong working relationships with neighboring Democratic committees, and with increasingly effective Indivisible and resistance groups, including our own Rapp Resist, and those in Fauquier, Madison, Culpeper and Greene counties. We have big plans not only to continue increasing Democratic turnout, but also to win over independent voters and even conservative hearts and minds! 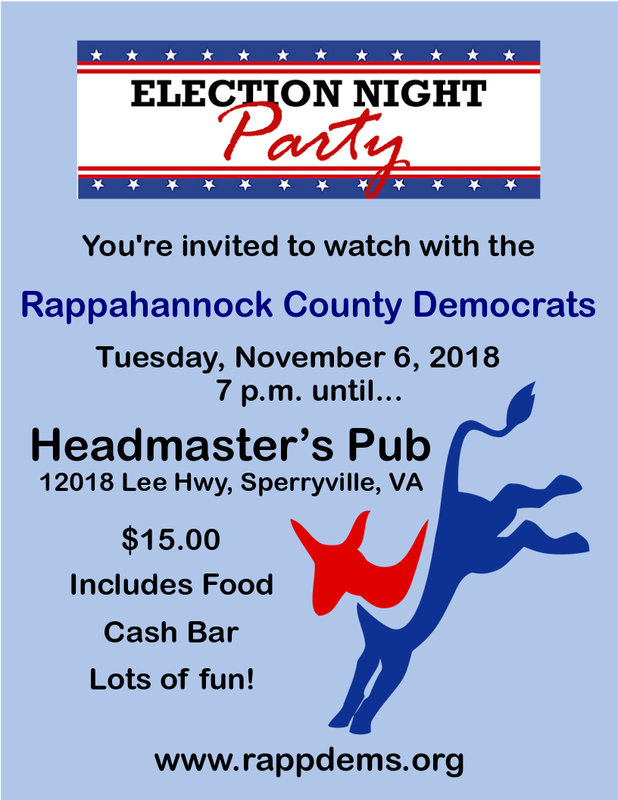 In 2019, Rappahannock will be involved in two races for State Legislature: the 18th District of the House of Delegates to unseat Republican Michael Webert, and the 26th Senate District to unseat Mark Obenshain. In the 26th, April Moore is stepping up as the Democratic challenger. 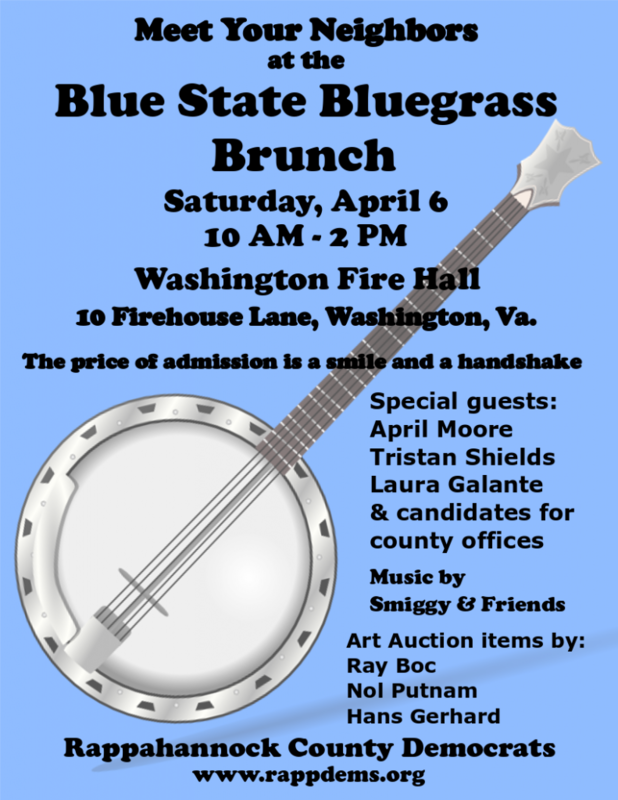 She ran against Obenshain in 2015, so she will be a seasoned opponent. We’re looking forward to working with you to flip the House of Delegates and the Senate! This is a crucial effort. With control of the House, we’ll be in a position, after the 2020 Census, to re-draw gerrymandered districts like the 5th in 2021. Have a wonderful holiday, enjoy your family and friends, and let’s get together again on January 12 for the first RCDC meeting of 2019!